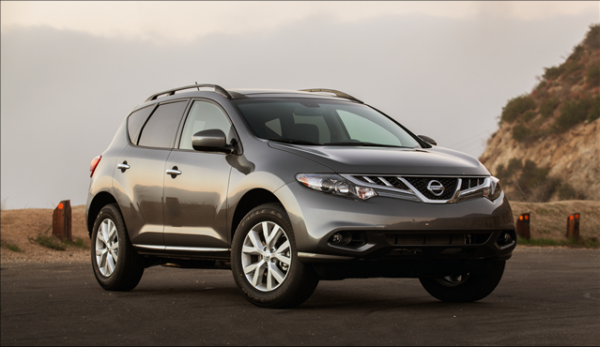 The 2014 Nissan Murano is now on sale in dealerships nationwide and its price, like most other Nissan models, remains unchanged from 2013. Prices for the premium SUV begin at $28,440. Nissan's announcement of the Murano's pricing continues the company's leveling of prices from last year. The manufacturer's suggested retail price (MSRP) of the 2014 Murano starts at $28,440 for the base Murano S front-wheel drive (FWD) model and rises to $39,480 for the top-fit Murano LE all-wheel drive (AWD). A total of eight trim packages are available, including value packages for the best-selling SV trim level. The 2014 Nissan Murano is the company's lead crossover and most premium offering in the segment, with a long list of available features, including new options such as Moving Object Detection (MOD), Blind Spot Warning (BSW) and Lane Departure Warning (LDW) systems. A new graphite interior and Tinted Bronze exterior color option are new this year. Comfort and convenience features include the company's beautiful Dual Panel Power Moonroof as well as a 7-inch color monitor, Nissan Intelligent Key with Push Button Ignition and a 9-speaker plus subwoofer premium Bose audio system. Prices do not include destination and handling. The Murano comes equipped with a standard 3.5-liter dual overhead cam (DOHC) V6 producing 260 horsepower through an advanced Xtronic CVT (continuously variable transmission). Retail pricing for the new Murano CrossCabriolet convertible model has not yet been released.